Full of colonial charm and coastal appeal, the city of Xiamen is one of the most alluring tourist destinations in the Fujian province and lies on the east coast of China. Visitors have been staying in Xiamen for literally hundreds of years and the city still contains much of its captivating character from years gone by, particularly around the scenic waterfront area. Close to Xiamen, many visitors enjoy a day trip to the small neighbouring island of Gulangyu, which is brimming with picturesque seaside gardens, a maze of peaceful cobbled lanes, cable car rides, statues, gardens and many excellent views. 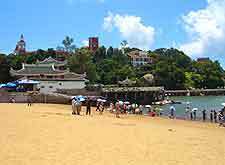 Also nearby is a further island, which contains a town of the same name (Xiamen) and is linked to the city of Xiamen by a causeway. The city itself is very much a mix of old and new, with historic architecture, winding alleyways and parklands being particularly centred around the western region and around the waterfront. Elsewhere in the city you will find banks, markets, temples, the Xiamen University and also the World trade centre, complete with its own cinema. Various Internet cafes are located around the harbour area and offer an easy way to email friends are relatives during your stay. For up-to-the minute tourism advice, information about where to find the best Internet cafes, fold-up English-language maps and information about Xiamen's top tourist attractions, the China International Travel Services (CITS) can be found along Hexiang Xilu, close to Yundang Lake. Many appealing tourist attractions lie within the city of Xiamen. When visiting, look out for the beaches - with many beautiful golden stretches around the coastline; Huli Hill Fort - an unusual fortress built with clay and sticky rice, amongst other building materials; Xiamen's Underwater Sea World - with literally thousands of marine creatures and an underwater glass tunnel; White Deer Cave - an interesting cave temple with two large animal statues at the entrance; Xiamen Water Park - a great way to cool down on a hot day, with slides and pools for everyone; and the Zhongshan Park and Zoo - a large recreational space, complete with a boating lake and a large zoo, with lots of animal information. 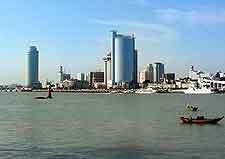 More information about Xiamen Tourist Attractions. Around Xiamen you will discover innumerable landmarks, shrines, temples and stunning monuments. 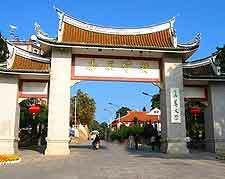 Highlights include Nanputuo Temple - comprising several historic buildings and known for its mountainous scenery; Sunlight Rock - next to Xiamen and located on the neighbouring Gulangyu Island, overlooking the harbour; Zheng Chenggong Memorial Hall - commemorating Zheng Chenggong and his victorious battle against the Dutch; Jimei School Village - founded by a prominent local, when the neighbouring area of Jimei was transformed into an acclaimed student town; and Xiamen's Wanshi Botanical Garden - a horticultural treat, with Chinese plants, landscaping and lots of large rocks. More information about Xiamen Landmarks. A city with many museums and galleries, Xiamen has much to offer those who appreciate cultural attractions. Particularly popular is the Bridge Museum - with information about some of Xiamen's greatest engineering feats; Museum of Anthropology - sited within Xiamen University and boasting a large number of anthropological exhibits; Piano Museum - an unusual and famous museum on Gulangyu Island, showing almost 100 different pianos; Xiamen Museum - the city's premier museum, with information about the area's history and thousands of local artefacts; and the Chinese European Art Center - exhibiting art works from China and all around Europe. More information about Xiamen Museums and Xiamen Art Galleries. For many, Xiamen offers plenty of tourist appeal in its own right, although it does offer a great base to explore this part of China's Fujian province. 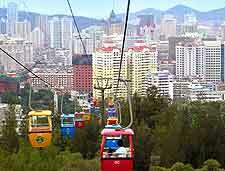 Especially close to Xiamen is the city of Fuzhou and its famous White Pagoda, the nearby mountainous landscape and unusual Hakka earth buildings in Yongding, the temples and Maritime Museum in Quanzhou, and the popular resort of Wuyi Shan, close to Xiamen and boasting mountain peaks, walking trails, and an impressive waterfront. 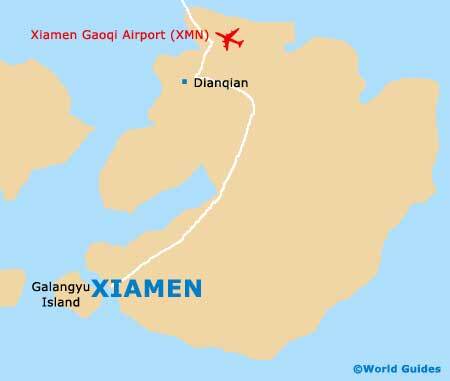 More information about Xiamen Attractions Nearby.